One of the main reasons why people name things is so that they can refer to those things easily later. This applies to the real world. This applies to HTML as well where you have not one, not two, but THREE different ways of naming elements. In this tutorial, you will learn all about them...and then some! Let's get started! In HTML, you can name your elements via the id attribute, class attribute, or the name attribute. In the following sections, you'll learn how to specify them and any special tricks you need to be aware of when using them. In the above example, notice I give my p tag an id value of logoText. Once you have done this, you can always reference this tag by simply looking for the element whose id value is logoText. You can only specify one id value per element. In HTML5, you cannot start an id value with a space character, but pretty much anything else goes. Names set via the class attribute do not have the same restrictions as they would if set via id. You can reuse the same class value as many times as you want, and you can specify multiple names per class as well. Notice that all of the p tags have their class value specified, and each of them have multiple values for class. Also, notice that the unread and old class values are used twice as well. The name attribute is commonly used with form elements. When you submit your form, you can use the name value to identify the form data. You can see this in action by looking at the Creating an E-mail Contact Form article. Because the tutorials I listed in the previous line cover this in great detail, I won't rehash that information here. Which to use - Class or ID? The answer to this is more straightforward than it seems. When naming elements in HTML, ask yourself whether you want to apply this name to many items or just a single item. The answer to that will determine whether you end up specifying a class value for the name, an id value for the name, or both class and id! Notice that the names are unique. For this crowd, there are no duplicate first names. Therefore, when you call someone by their name, only that person will answer. This is great for getting just a single person's attention. 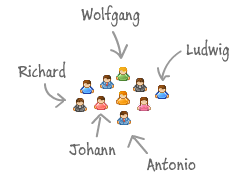 With class values, you can specify more than one name, so let's tag a few of them as German as well. Remember, there is nothing that prevents you from combining specific names and generic names. Just because Ludwig has a proper name does not mean that he cannot be both a Composer and a German. So, to bring the example full circle and to summarize, if you want to go with a name to apply to multiple elements, specify the class value. If you want to go with a name to apply to only a single instance, set the id. Oftentimes, you will need to set both the class and id value as well, so be prepared to do that as well if needed. Note that I am not going to talk about the name attribute here, for its scope is too limited to be of any use in this discussion.